Along with the holidays come the house guests. We’re all happy to see them, but sometimes feeding them becomes a challenge. One answer for the harried host is this eggy casserole that can be made the night before and slipped into the oven to bake while you attend to other tasks. It contains all the basic breakfast food groups in one tasty dish that’s always popular with my family. The original idea for this recipe came from The Junior League of Pasadena’s venerable “The California Heritage Cookbook” (Doubleday, 1976). If you spot a copy at a yard sale, snap it up. The casserole is called “Tahoe Brunch” and my friend Ned made it his signature dish for years. 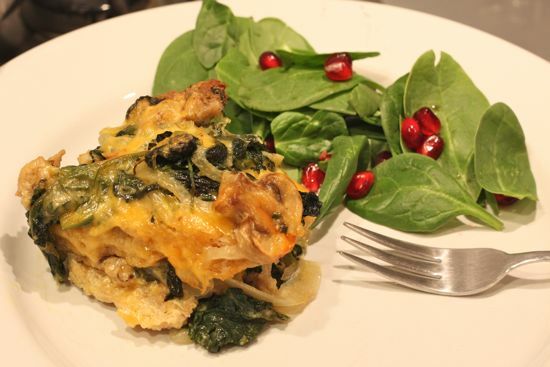 Today this sort of dish is more commonly known as a strata. 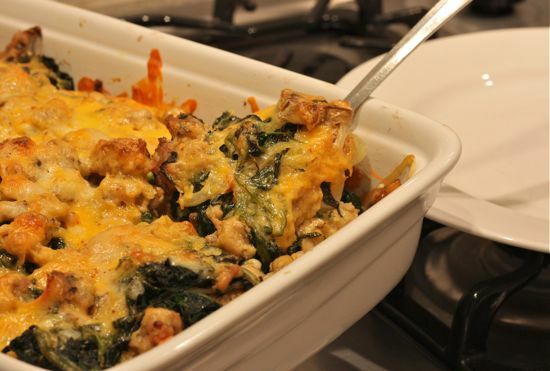 I’ve updated the recipe with whole grain bread, chicken sausage and spinach. I cut the butter in half, too, but it will never qualify as health food. This is a holiday indulgence, all the more irresistible for its unconscionable measure of melted cheese that turns golden brown and crusty at the edges. The secret is good bread – I like a seven-grain artisan loaf from the local natural foods market – and extra-sharp cheddar cheese. A little Gruyere is added for more flavor and creaminess. The flavor is mild in deference to those who prefer comfort food in the morning. Set out a bottle of hot sauce, though, for guests who like a little more heat. Serve this for breakfast and no one will suspect that you were out walking the dogs instead of working in the kitchen at dawn. If there are any leftovers, they’ll rewarm nicely for a midnight snack. 1 teaspoon ground nutmegButter a 9 x 13-inch shallow baking dish.In a large skillet, melt butter and saute onions for a couple of minutes, then add mushrooms and saute until tender, 5-10 minutes. Meanwhile, squeeze excess water out of thawed spinach. When mushrooms and onions are done, stir in spinach, season with salt and pepper to taste and use a slotted spoon to transfer mixture to a bowl. Set aside. In the same skillet, cook the sausage until lightly browned, breaking it up into bite-sized chunks as you stir. You may need to use a little more butter or olive oil. Line the baking dish with half the bread in a single layer. Top with half the vegetable mixture, spread evenly over the bread, then half the sausage and half the cheese. Repeat the layers one more time, ending with the cheese. In a medium bowl, whisk together the eggs, milk, prepared and dry mustard, nutmeg, and salt and pepper until well blended. Pour evenly over the layers in the baking dish. Cover with foil or plastic wrap and refrigerate overnight. In the morning, remove baking dish from refrigerator and preheat oven to 350 degrees. Bake uncovered for about an hour, until browned and bubbly. Serve warm.